MANAWAIOPUNA FALLS is not only difficult to wrap your tongue around, it’s also hard to find. Located in the wild on private property, it is off-limits to the ordinary person. Many are familiar with these falls from the 1993 blockbuster JURASSIC PARK; the movie is how the 360-foot gusher in a valley near HANAPEPE gained its worldly fame. Thankfully, ISLAND HELICOPTERS owner and experienced pilot Curt Lofstedt is no ordinary person. He’s been flying tours over MANAWAIOPUNA FALLS for years. But five years ago, he and his wife, Bonnie, began seeking state and county permits to LAND AT THE FALLS. In May 2010, they succeeded and have been flying visitors to Manawaiopuna Falls ever since. The landing is part of the company’s deluxe Grand Circle Island helicopter tour. After touchdown, participants take a short, guided walk to the falls, during which they learn about flora, fauna and historical attributes of the area. 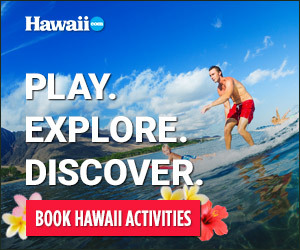 Based at Kaua‘i’s main airport in Lihu‘e, Island Helicopters operates tours are available five days a week.